I’ve been meaning to post an update here for a very long time. But when things aren’t going very well, it’s hard to find the energy to put that into words. 2017 was a very hard year, but 2018 has gotten much better! Hazel is continuing to grow and develop at her own rate. We have nested into a home we love in Belle Isle, FL. We have so much to be thankful for! Here’s our top gratitudes for 2018 (in no particular order). We hope 2019 will bring continued joy, happiness, and progress for Hazel and her friends! Our team of day and night nurses. Some have been with us for over a year and are loving, caring, and take amazing care of Hazel so that we can sleep, work, and get some respite. Hazel’s team of therapists. She has shown so much potential, especially in physical therapy! Dr. Yr, our neurologist. She has worked relentlessly to figure out why Hazel holds her breath. We are sad that we will soon have to find a new neurologist because this one is moving back to Europe! Dr. Maggie, our DOM. Dr. Maggie helped us eliminate foods that Hazel reacted poorly to and guided our through a modified GAPS diet. These changes helped ease 75% of Hazel’s breath holding issues. Dr. Maggie passed away unexpectedly in December, and we are so saddened by this loss. Dr. Sabogal, our pulmonologist. 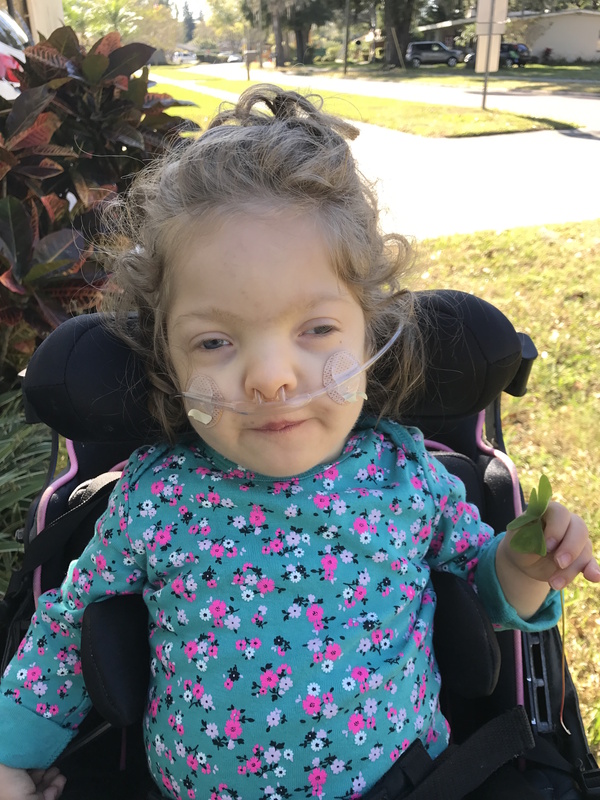 When all specialists wanted to trach Hazel due to her severe sleep apnea and breath holding issues, this doctor listened to us and had Hazel’s quality of life in mind when he made recommendations. Now Hazel is mostly off oxygen at night and uses the biPap infrequently! He looks at the whole patient and not a chart of symptoms/check boxes. The Gardiner Scholarship. Hazel is homeschooled and we receive this special needs scholarship through the state of Florida. It pays for expensive therapy equipment for in-home use, as well as extra therapies at home. It is amazing! MedWaiver/Medicaid insurance. 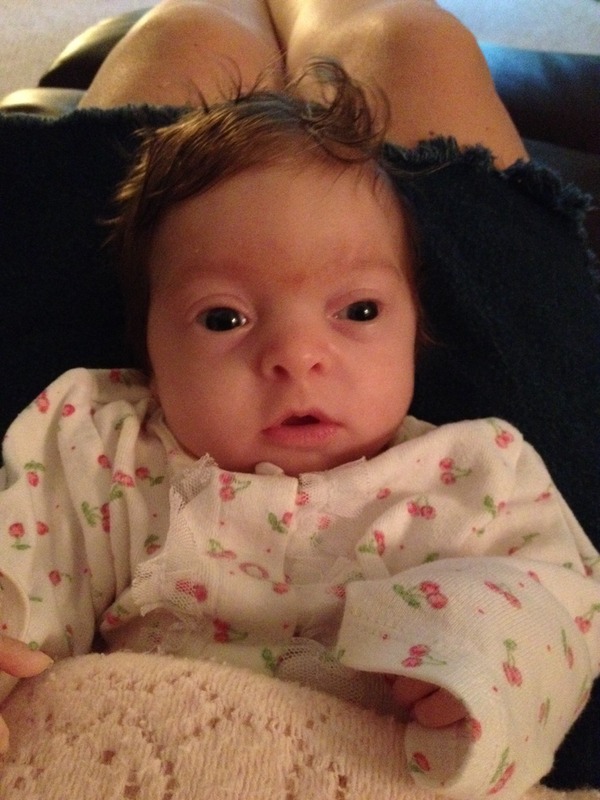 We are so very grateful that Hazel receives Medicaid through the MedWaiver program. Without Medicaid, we couldn’t have skilled nursing and I would have had to quit the job I love. Great x-rays. Her hips “look amazing” according to the orthopedist. Her spine is showing some curvature, but he hopes that continued trunk control and strength will eliminate the need for more intervention. New wheelchair, stander and SleepSafe bed from NuMotion. Hazel is sleeping beautifully most nights in her big-girl bed! No more crib for our girl. Nathaniel’s Hope. This local non-profit puts on events for VIP children with special needs. We can’t wait to take Hazel to Buddy Breaks again next year, if she continues to be well enough to go to these fun mornings out! The end of gagging. We discovered that Hazel was gagging from a combination of CBD oil and food that was too dense. 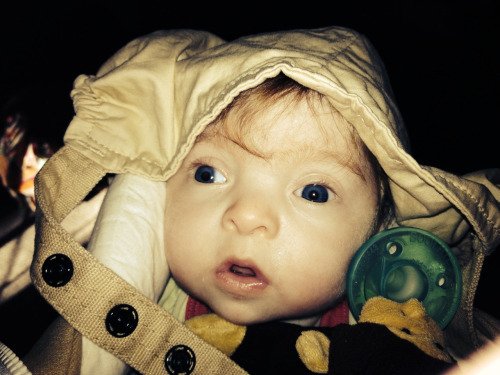 We want her to gain weight, and it’s very hard to know why a non-verbal child isn’t feeling well. Drinking better/passed swallow study. Hazel often refuses to drink, which can be scary and frustrating. She passed her swallow study on thin liquids and has been drinking from a straw for the past two months. Phew! 5-year birthday party. We can’t believe our baby girl is 5! We are thankful for every day. New house in Orlando. We love our new house and have really invested in making it our “oasis” because we spend so much time at home when Hazel isn’t feeling well. Grandparents’ help. Greg and I love to travel and have had the opportunity to travel locally and internationally this year thanks to both sets of Hazel’s grandparents, who help with her care so we can be carefree for a few days! We wish you many blessing in 2019. Thanks for all the love and support! This entry was posted in Uncategorized on December 29, 2018 by Carrie. We met mice with BOS! 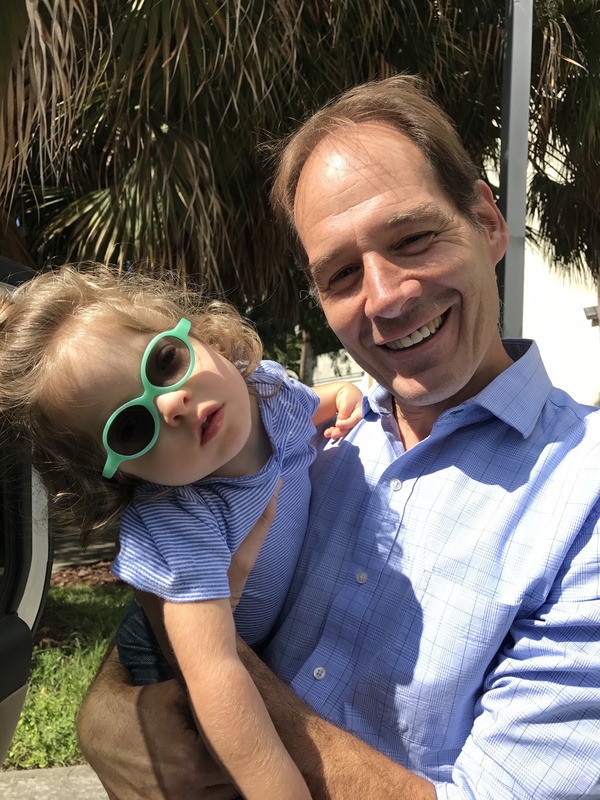 On Friday, November 18, 2016, our family had the opportunity to meet with two researchers at the University of Miami who are studying the gene that causes Bohring-Opitz Syndrome (BOS). Hazel, Greg, and I visited these scientists to learn more about current BOS research, and to find out how to further motivate and fund research on BOS. Dr. Juan Young and Dr. Feng-Chun Yang were kind enough to meet with us for the morning so we could tour their labs, introduce them to Hazel, and learn about their research projects. As many of you know, BOS is caused by a mutation on the ASXL1 gene. This mutation causes BOS at conception, but can also cause some forms of cancer when the ASXL1 gene mutates in adulthood. First we met with Dr. Yang, who explained that she studies the molecules that cause cancer. She primarily researches mutations in the ASXL1, ASXL2, and ASXL3 genes. Her ultimate goal is to discover therapies to treat cancer. Dr. Young is a neurobiologist who studies the genetic causes of inherited diseases. He works to create animal models who have genetic diseases. He is known for his work with a genetic disorder called Rett Syndrome. We are very fortunate that both doctors are medical advisors to the Bohring-Opitz Syndrome Foundation! The doctors spent time giving us tours of their labs, introduced us to their colleagues and doctoral students, and were patient when our eyes glazed over at high-level scientific concepts. They were very interested in meeting Hazel, because neither had met a child with BOS before! After learning about their research, Greg and I were able to reach the pinnacle of our visit — a chance to meet the mice that have BOS! Unfortunately, Hazel was not able to meet the mice (we promised her a trip to the pet store this week) because the animal model area is very sterile. We had to put on a ton of protective clothing, walk through an air bath, and wear masks so that we did not infect the mice with any outside contaminants. Dr. Young brought us back to the mice room, and pulled out the tank containing the mice with BOS. The mice had just had pups in two of the containers, so we couldn’t disturb them. He pulled out an adult mouse and held it out for us to inspect. He then brought us to the mice testing area, where they have standardized tests and mazes to study things like anxiety, ability to learn, memory, and even empathy! We were amazed. We were able to ask Dr. Young about how the mice with BOS perform in the tests. He explained that the mice with BOS seem to have some learning disabilities and anxiety issues that typical mice do not have. Next, we met Dr. Mustafa Tekin, who is a clinical and molecular geneticist at U of M. He was gracious enough to meet Hazel between seeing patients at clinic, and we will be back to meet with him in clinic so that we can add to the knowledge mix of these researchers at the university. A BOS patient registry is going to greatly help further their research. One of our other medical advisors, Dr. Bianca Russell, has one in the works, and is currently navigating the red tape involved with setting up a research registry. She hopes to launch it very soon, and it will be extremely important for all people affected by BOS. Hazel meets BOS researcher Dr. Juan Young! Doctors Young and Yang are connecting us with other researchers and partners to help us spread awareness of BOS and continue to motivate BOS research. Hazel, Greg and I will be attending the ACMG Annual Clinical Genetics Meeting in Phoenix in March of 2017 to continue to network with researchers and spread awareness of BOS. Hazel and I will meet with the doctors at the University of Miami on a regular basis to touch base on research (and to check on the mice!). We had an amazing day, and are inspired and filled with hope to see the passion and dedication of these researchers. A huge thank you to Dr. Young and Dr. Yang for spending so much time with us! To help the BOS Foundation continue our progress in motivating BOS research, please donate today! Your donations will help us attend the ACMG Annual Meeting in Phoenix in March as well as other rare summit events throughout the year. Thanks for your continued support! All November and December donations of $20 or more will receive a BOS holiday ornament. Donate before December 10 to get yours before the holidays! This entry was posted in Uncategorized on November 29, 2016 by Carrie. We moved from Gainesville (our college town) to Orlando, Florida in May of 2016. Hazel’s dad got a new job that allowed us to relocate, and we moved to be closer to Hazel’s grandparents so that we could get extra help. 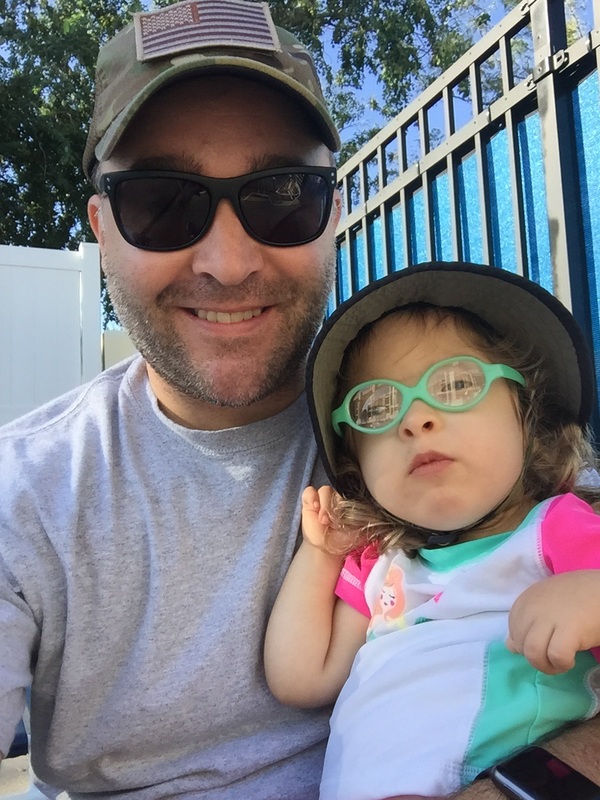 We also wanted Hazel to be able to attend a special needs charter school that offered preschool for toddlers. Hazel started school! This was a big deal for both Hazel and me. Hazel stayed at home with me or a nanny until June. Hazel has been doing well at the charter school, and it has been life-changing for my stress levels. I have time to get my work done, exercise, and have a tiny personal life! Hazel turned 3! This is a big deal because she’s now enrolled in the public school system, rather than Early Intervention. We can apply for different services and are now on the medwaiver waitlist. Unfortunately, there’s still a 10-year waitlist to get on Medicaid if a child is medically needy, so we are still fighting the battle to get certain services. 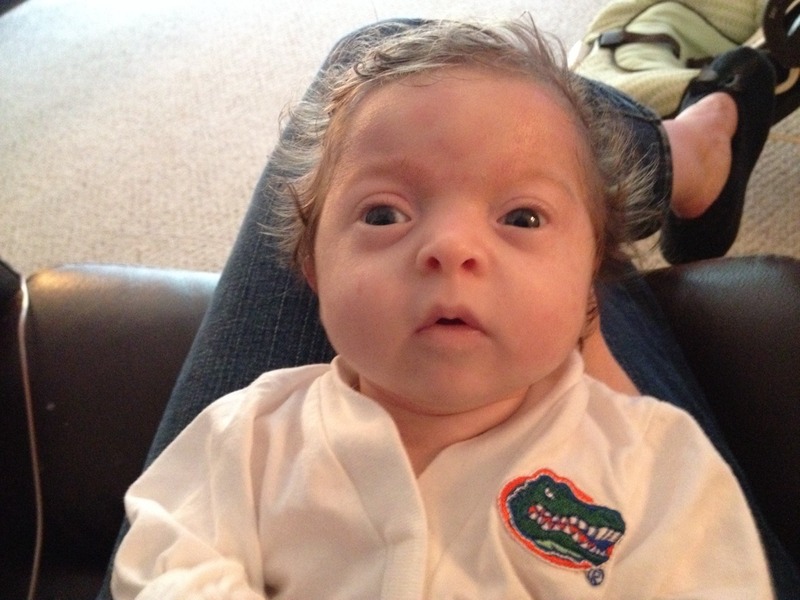 If anyone has experience getting a child with a severe disability onto SSI or Medicaid in Florida, please let me know! I’m currently getting ready to talk to our local representatives to explain our situation. Unfortunately, Hazel was diagnosed with severe sleep apnea in July. We have tried a CPAP for a few months, but it has not been successful in moderating the sleep apnea because Hazel moves so much in her sleep. We have decided to have Hazel’s tonsils and adenoids removed later this month. Because her mouth and nose are smaller than typical, removing these tissues will help her breathe easier, and will also hopefully stop the chronic sinus infections she suffers from. I pray that the surgery will successfully reduce her obstructive sleep apnea so that she can sleep easier and avoid wearing the CPAP. 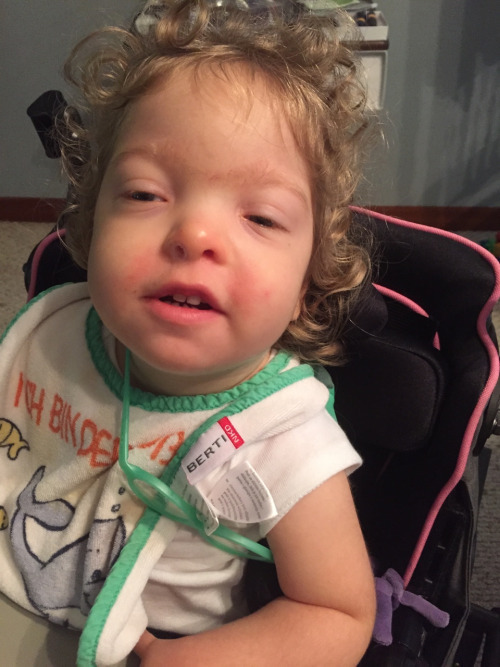 Hazel started several new therapies! She gets OT, SLP, and PT at school and after school in a clinic (we still stay busy!) and she enjoys Aqua OT, conductive education, and now hippotherapy! We’ve seen improvements in her head and trunk control. We also believe conductive education has taught her how to bring her spoon to her mouth when eating her purees. We are so proud of our little Bean! Thanks for all of your support. As our life reaches our new normal, I hope to post more often! This entry was posted in Updates on October 19, 2016 by Carrie. Help Hazel meet new BOS friends! Meeting other children with BOS for the first time! 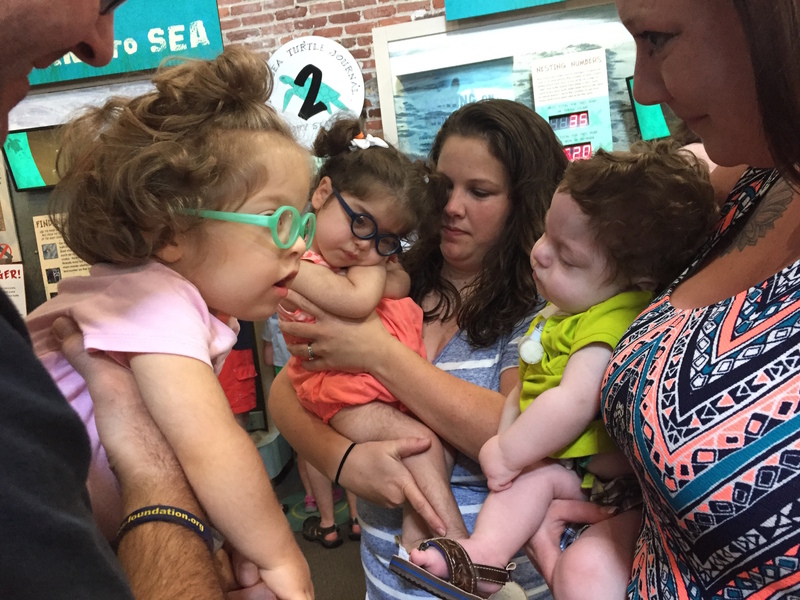 A few weeks ago, Hazel, Greg and I were able to meet with two other families who have children with Bohring-Opitz Syndrome. This was an exciting experience for us, as we were able to meet other children like Hazel for the first time. Since there are less than 60 known cases of BOS in the world, it’s very rare to be able to meet other families living with this condition. We were able to compare treatment notes, try out each other’s equipment, and bond over our shared parenting experience. In August, the BOS Foundation is hosting the first official BOS meet-up in Philadelphia. This meet-up will give other families the opportunity to have the same experience we had, but on a much larger scale. Families will unite to celebrate our children and to share information on the best ways to care for them and thrive as very unique families. We will also have the chance to meet a few of the medical experts who research BOS. 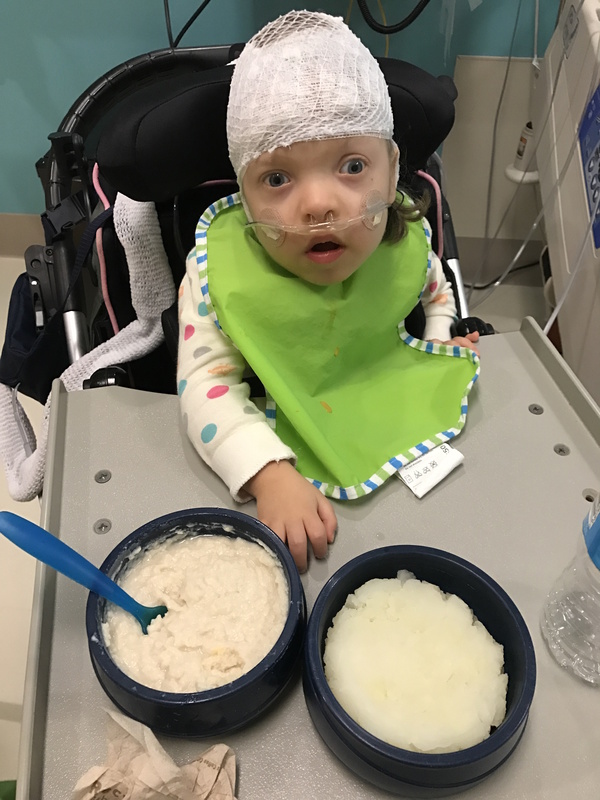 This is a fantastic opportunity to raise awareness of BOS among our medical community, motivate BOS research, and get answers on the best course of treatment for Hazel and children like her. I have a personal goal of raising at least $500 to help pay for this event. Could you help me meet this goal? Your funds will help pay for the cost of the venue, food, medical advisory board travel, face painter, and goody bags for the families. Hazel has agreed to send a personalized piece of artwork to every friend and family member who contributes by June 30! You may also purchase BOS Awareness T-Shirts through our Booster Fundraiser. The sale ends June 30! 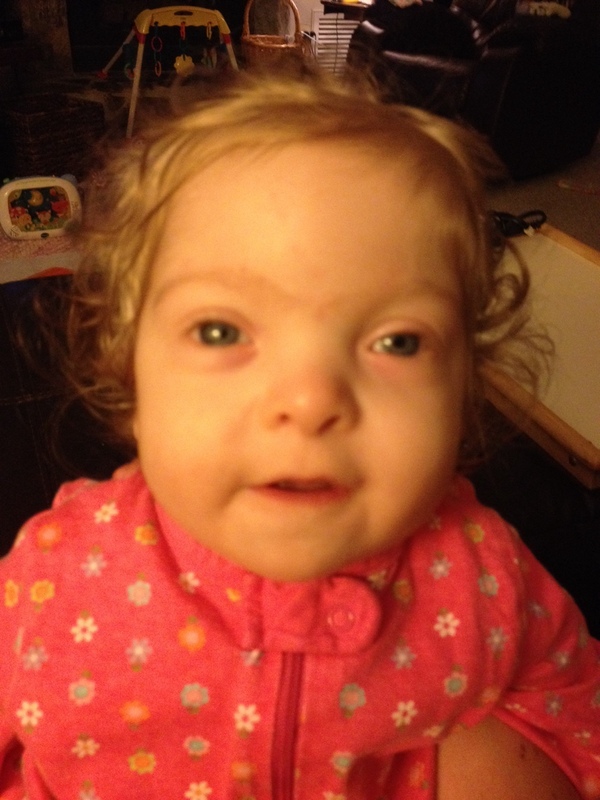 Thank you so much for your support of Hazel and other kids living with BOS! This entry was posted in Uncategorized on June 12, 2016 by Carrie. Hazel loves things that light up! Each year, we sit down with our Early Intervention Service Providers and come up with a plan for Hazel’s services. When creating Hazel’s therapy objectives for the year, I decided to focus on helping her become more independent. I thought these goals would help alleviate some of the stress I felt as a parent, while benefitting Hazel’s development. 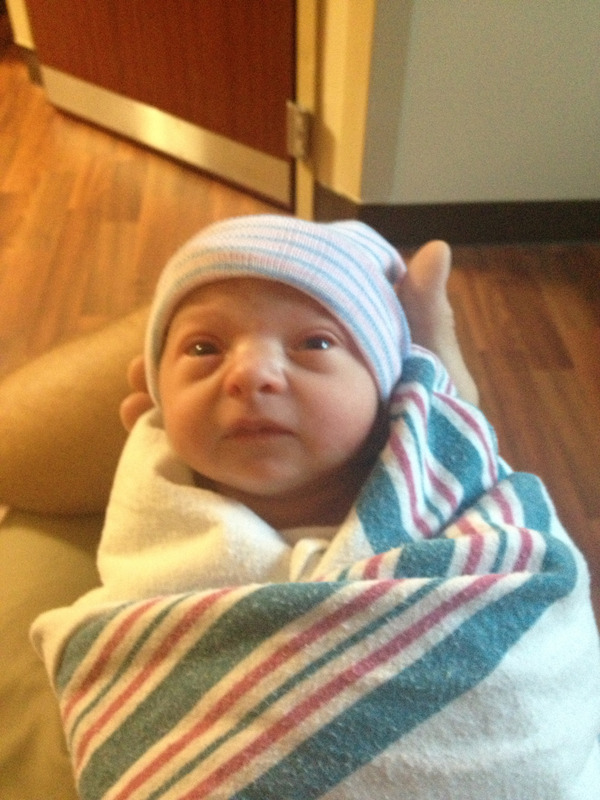 After a lot of thought, I felt we should focus on Hazel’s self-feeding skills, mobility, and communication. While we are so happy that Hazel now feeds without a tube, she does take a considerable amount of time to feed. She drinks from a bottle and eats pureed food, but she does not feed herself. She is not yet holding her own bottle, and she requires the same assistance when eating purees. Her bottles can take the longest to consume. It takes her anywhere from 10 to 30 minutes to finish a bottle, and she drinks three to five a day. She’s faster with purees, and these only take around 10 to 15 minutes to finish. A more challenging part of feeding is Hazel’s lack of trunk control. Because she requires a really supportive high chair, it is difficult to plan her meals outside of the house. We either have to bring along her adaptive Kid Cart, or feed her in an umbrella stroller or car seat. I am becoming better at being more flexible about feeding her outside of the home, and I feel less restricted by her feeding schedule. However, I do feel like our daily schedule revolves around when she needs to eat next and deciding what we can fit in between bottles and purees. When she’s not feeding or resting, Hazel is either playing or practicing her therapy exercises. She has been able to roll over since she was nine months old, but she is not yet sitting without support. When she’s on her belly, she can push her bottom in the air, or prop up on her elbows for a short amount of time, but never both at the same time. At times she seems to be trying to crawl, but she’s not coordinated enough to get anywhere. When she’s motivated to do so, she can travel around the room by rolling or wiggling across the floor. Other times she’s content to lay in one place. I want nothing more than to see her army crawl or sit unsupported. While progress is slow in this area, I do get hope from the tiny inchstones she’s making in her physical strength. She kicks and splashes more in the bathtub than ever before, and she will prop sit without complaint for a lot longer than she used to be able to. As Hazel has always shown us, she will make her milestones in her own time. I do hope to see her move purposely towards toys by the end of this year. She will make her momma even more proud! 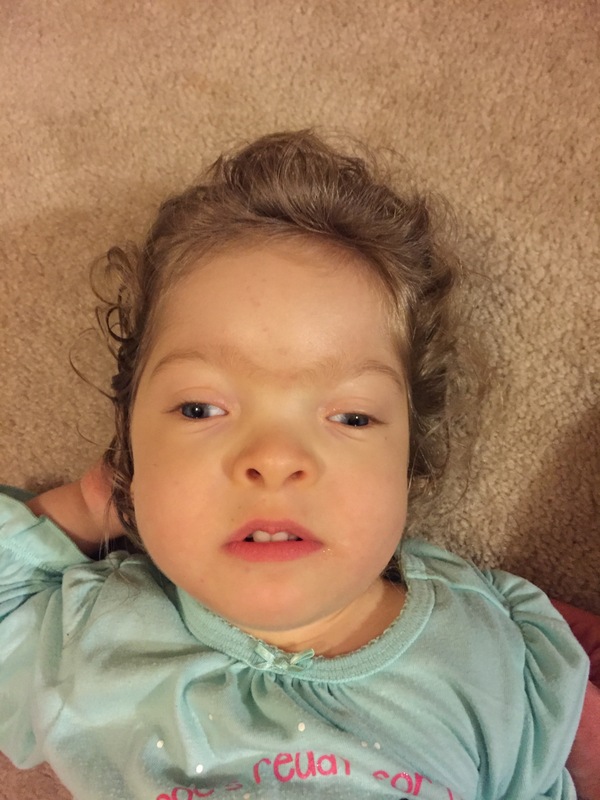 Besides her physical therapy, Hazel sees a speech therapist, as she is still waiting to verbally communicate with us. She makes many different types of noises, but nothing that seems to be communication. She is very social and will giggle and laugh at times, but we have not yet been able to get her to demonstrate preferences to us. For example, we are working on getting her to choose between two toys or two different foods. We want her to either fix her gaze on the item she wants, or two make a verbalization when the preferred item is in front of her. 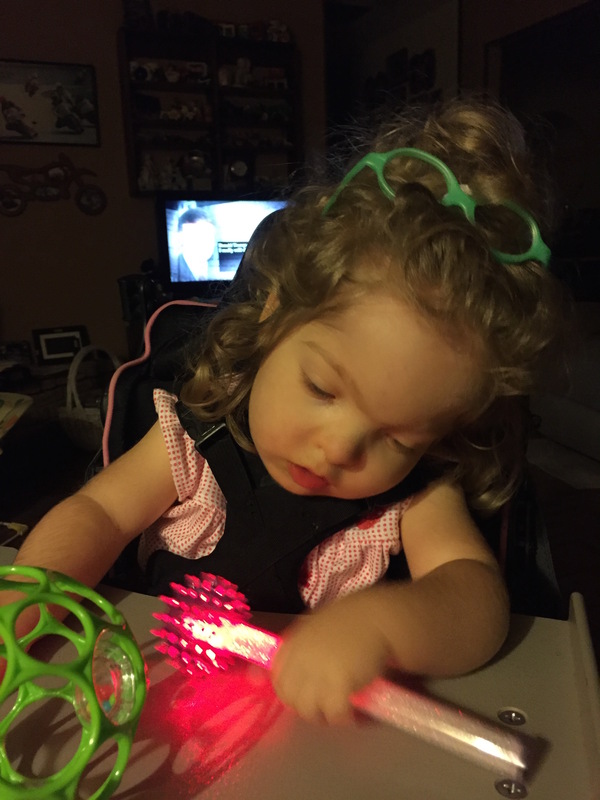 We are also working with adaptive switch toys to teach her cause and effect, which is an important part of learning to communicate. Each day, we focus on a few exercises that work on Hazel’s skills in feeding, mobility, and communication. While the definition of independence is different for our child, we celebrate our inchstones in development as any parent would. There are days when I push Hazel and myself a little harder, and there are days when I just want to lie on the floor with her and cuddle. While I have to revisit these goals occasionally to see if we are on track, I also have to remember that Hazel will continue to do things in her own time, and we are here to support her along the way. If you have ideas on ways to help Hazel feed herself or thoughts about things that may motivate her to mobilize, please send them my way! This entry was posted in Uncategorized on March 6, 2016 by Carrie. But now we have come full circle. The Bohring-Opitz Support Group created a portal that allows families and medical professionals working with children and young adults diagnosed with BOS to upload their photos. These photos will be loaded in the F2G system, and as I understand it, an algorithm will be created that will compare undiagnosed children’s facial features to known syndromes in the database. The process was very easy. I used the BOS portal, and uploaded several photos of Hazel at various ages (no glasses on, facing forward). The hardest part was picking the best photos, and then figuring out how old she was at each photo! After uploading the photos, I was asked to include limited demographic information such as race and gender. The process took me a little over an hour and most of that time was looking through the hundreds of photos to select the best ones! I am very excited that our family can contribute to this project. My hope is that many families with BOS will contribute to the F2G BOS portal and that researchers will soon use the app to help lead an undiagnosed child to an accurate diagnosis. Additional questions about how F2G works should soon be answered in an upcoming webinar with the F2G team and the creators of the BOS Support Group (Date TBD). Any interested BOS families, please stay tuned to their announcements! Here are more of the photos I used in the F2G BOS portal. Isn’t she awesome? This entry was posted in Uncategorized on February 27, 2016 by Carrie.